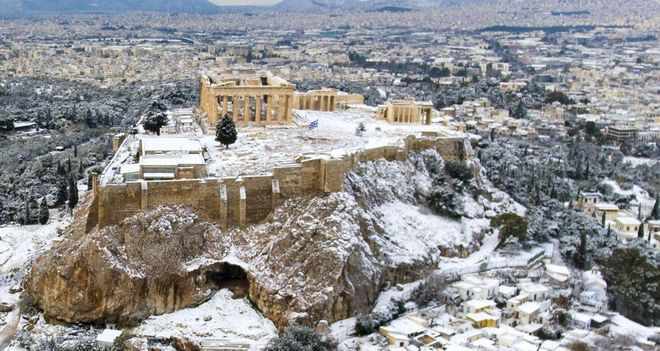 This is from a series of aerial photos that the Eurokinissi news agency took after snow fell on the Acropolis in Athens. 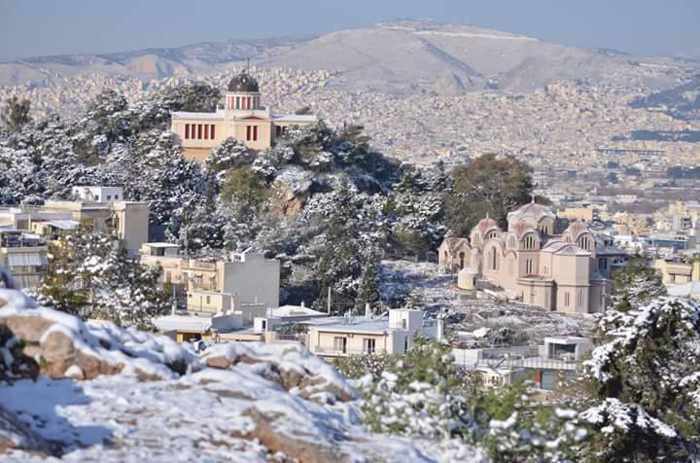 More of the agency’s aerial photos of the Acropolis, as well as the Plaka district of Athens, can be seen in the photo feature Μοναδικές εικόνες: Η χιονισμένη Ακρόπολη και η Πλάκα στα λευκά, published by news247. 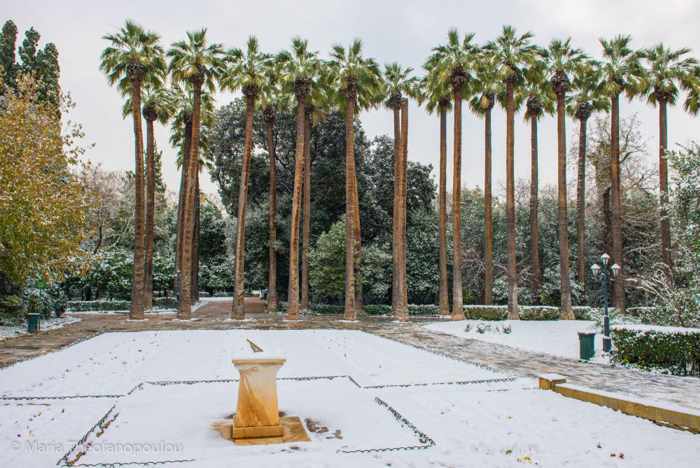 Snow covers the ground of the National Gardens in central Athens. 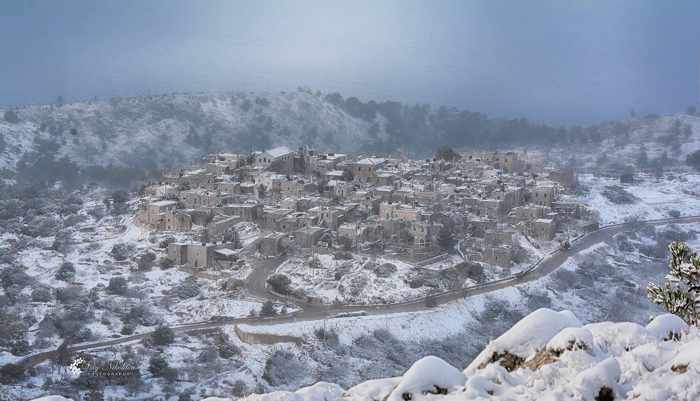 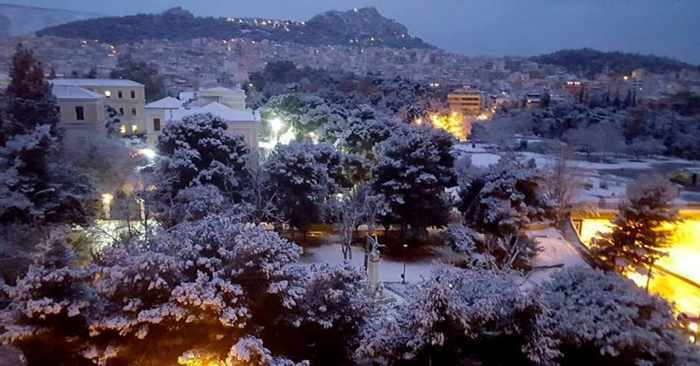 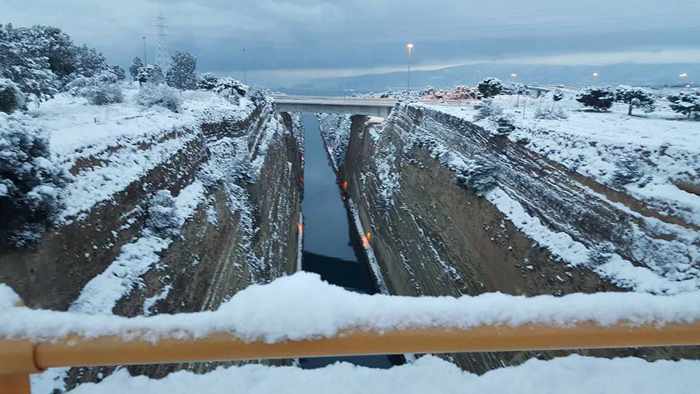 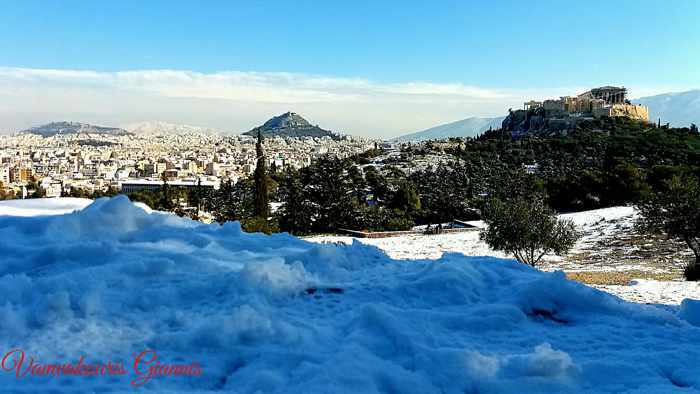 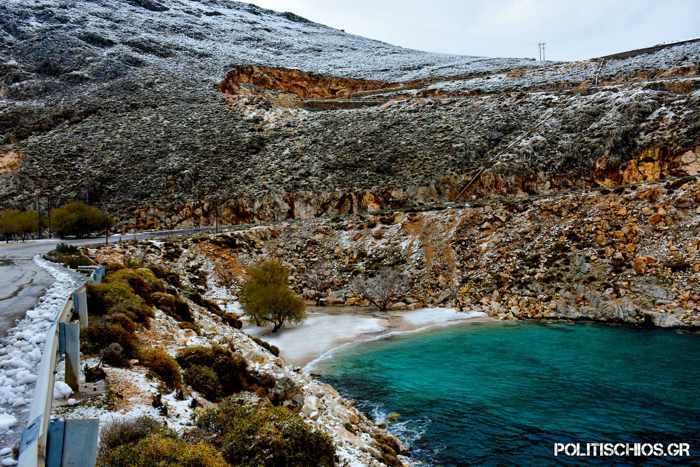 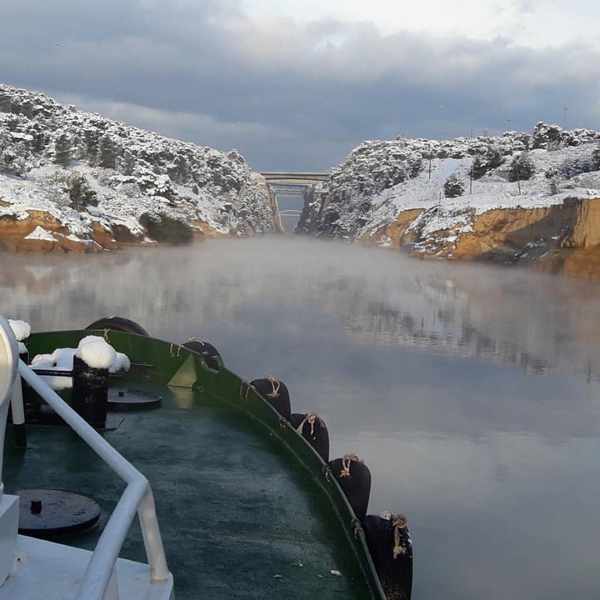 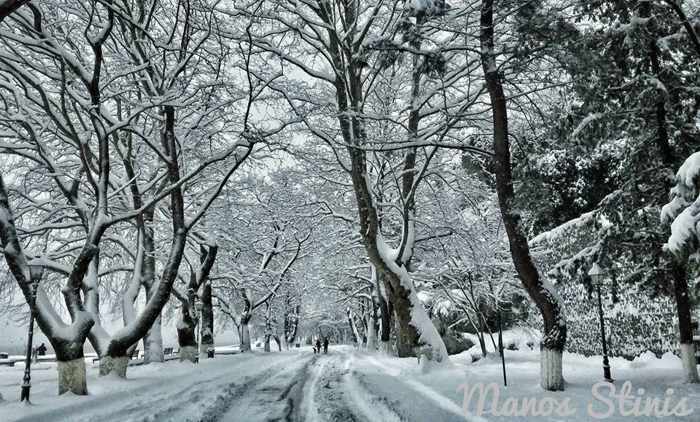 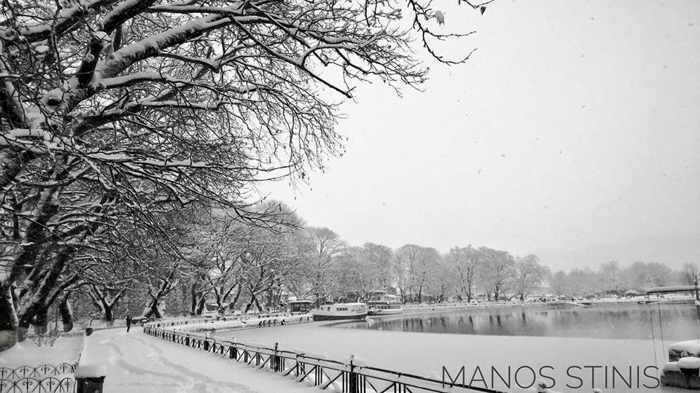 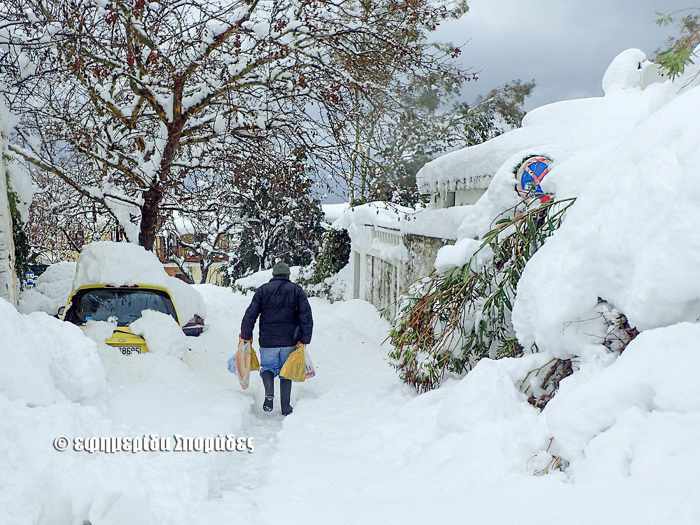 It is one of several photos by Maria Theofanopoulou that were published in the Greek Travel Pages article A Day of Sudden Snowfall in Athens on January 11. 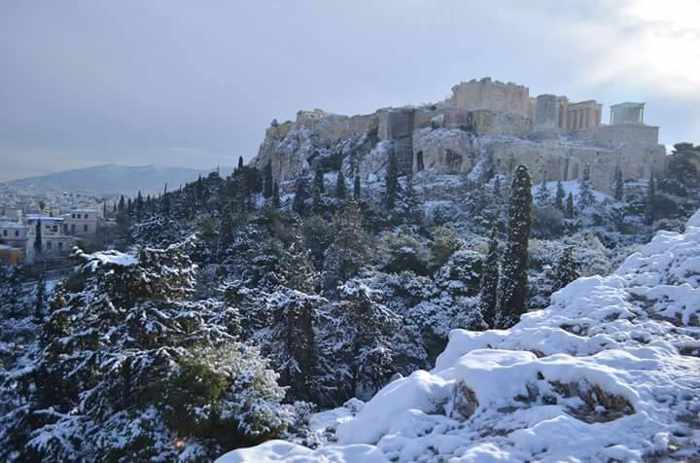 A view of the Acropolis in a photo from the Greece in Photos Facebook page. 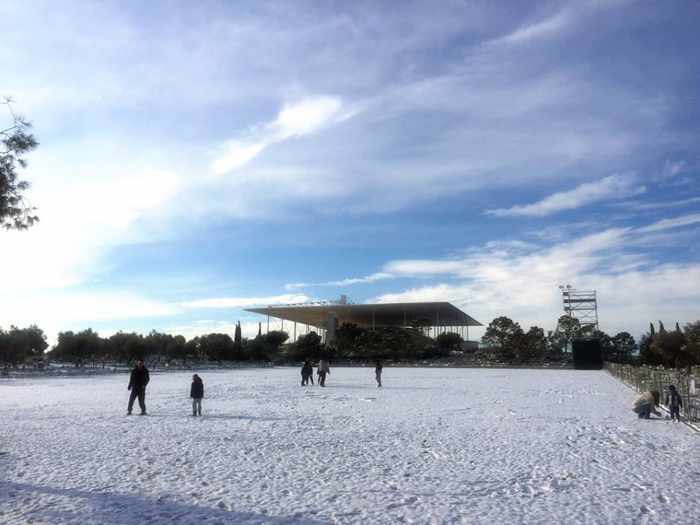 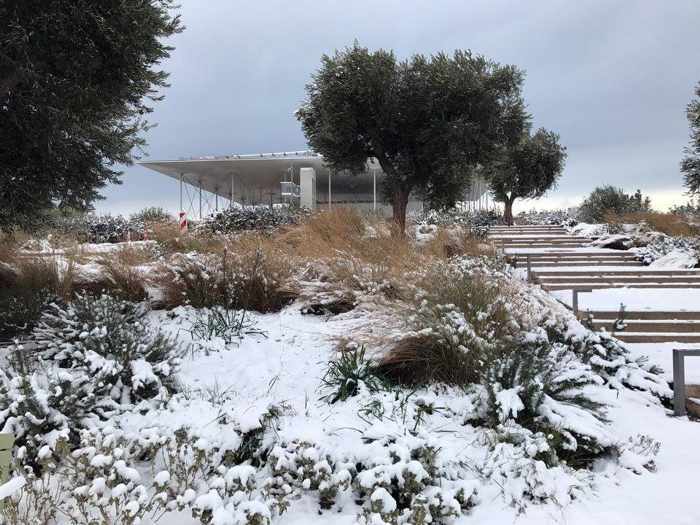 Snow covers the ground surrounding the Stavros Niarchos Foundation Cultural Center in Athens. 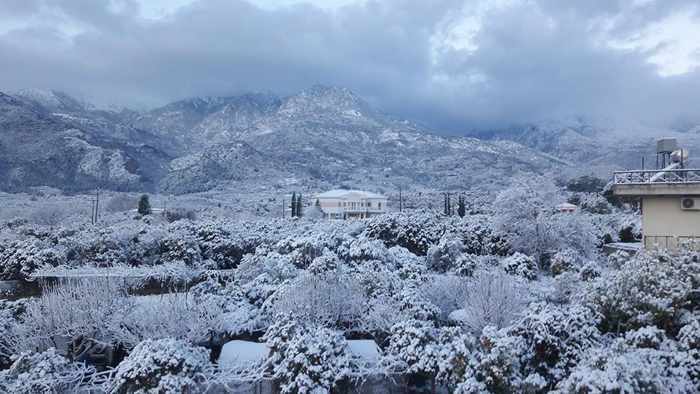 The image is from the center’s Facebook page. 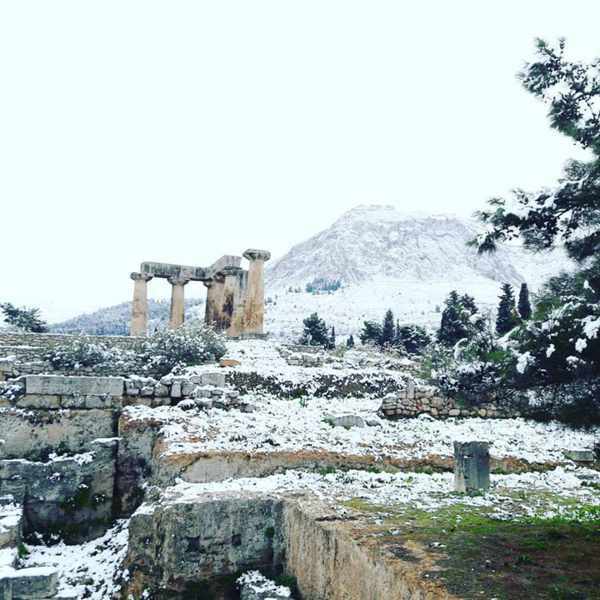 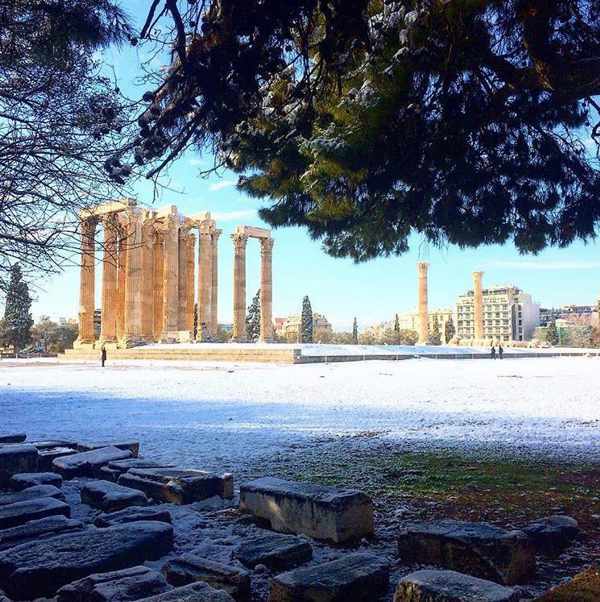 Light snow blankets the ground at the Temple of Olympian Zeus in the historic center of Athens. 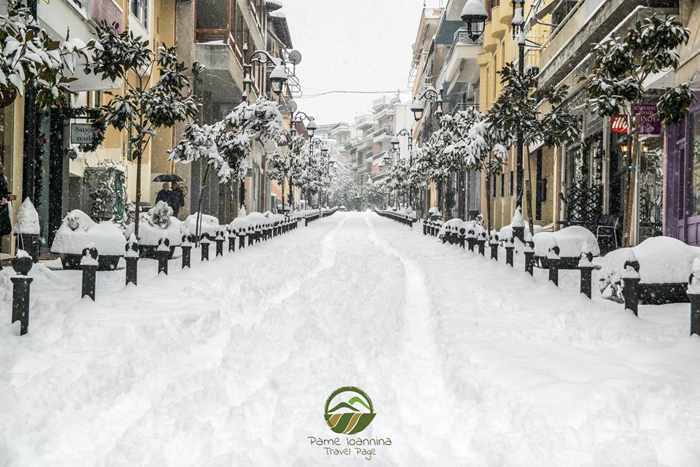 The photo appears on the This is Athens Facebook page. 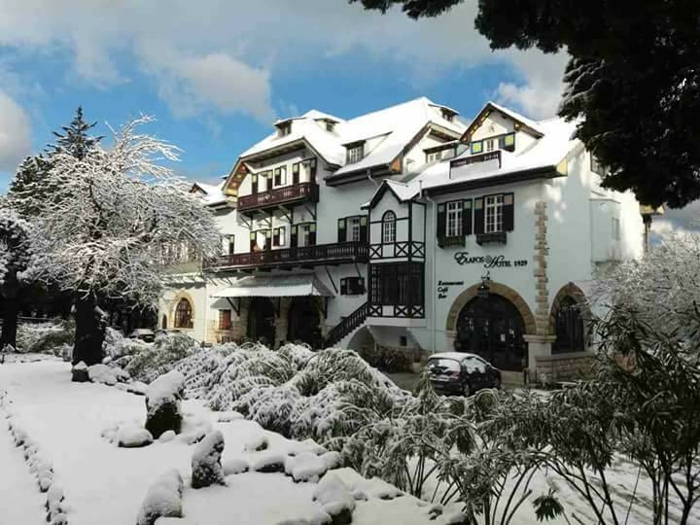 Snow falls on the courtyard terrace at the legendary Zonars restaurant and bar. 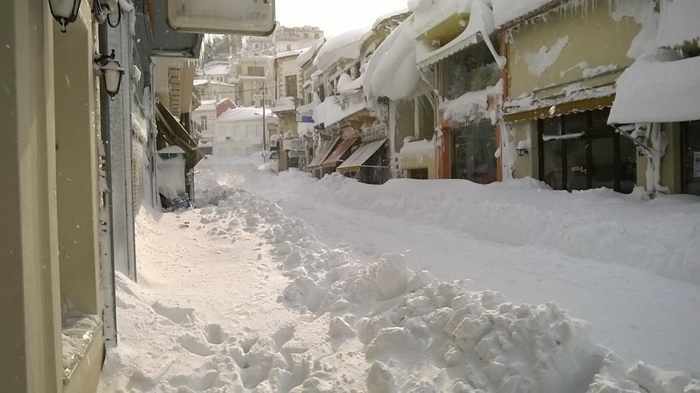 This photo was posted on the Zonars Facebook page. 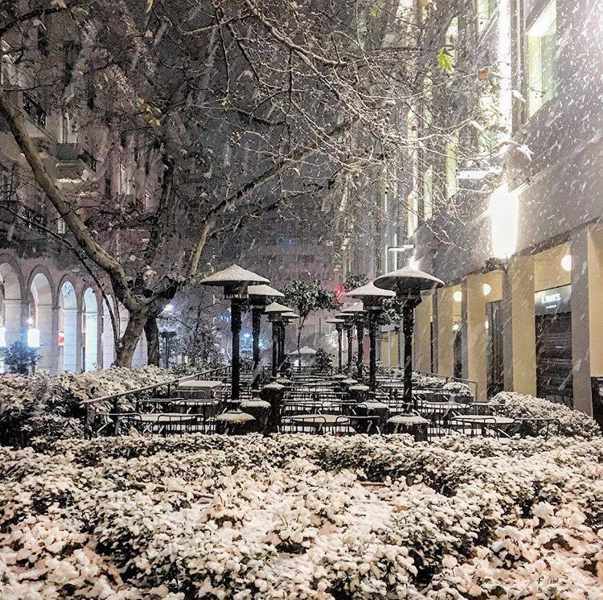 Another photo posted on Facebook by Vikh Nikolaoy. 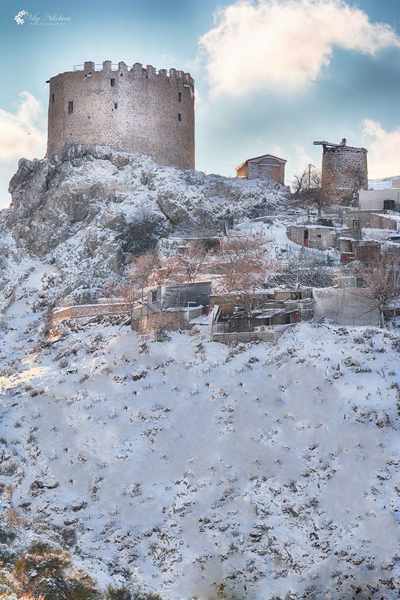 This is a view of the medieval tower of Pityoús. 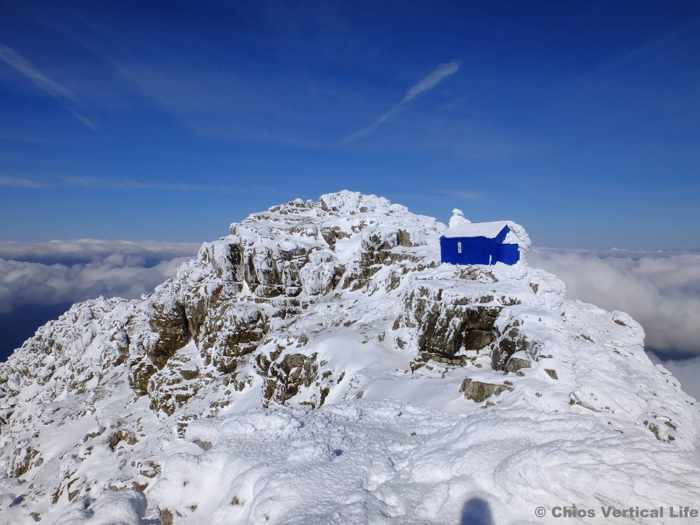 This striking photo of the cobalt-blue Holy Trinity church atop Mount Pelinaion was shared on Facebook by Chios Vertical Life. 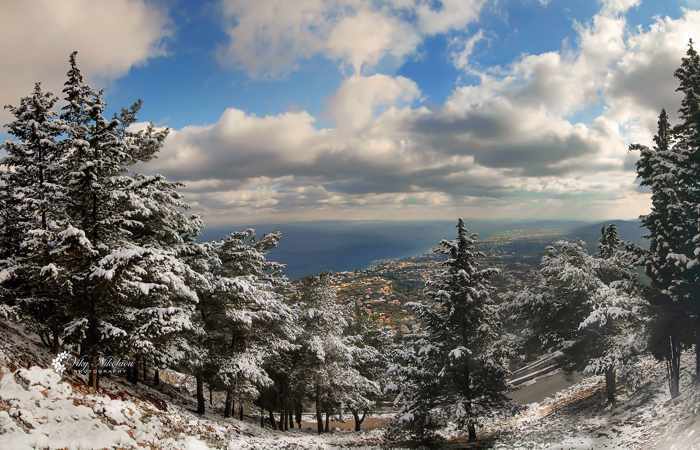 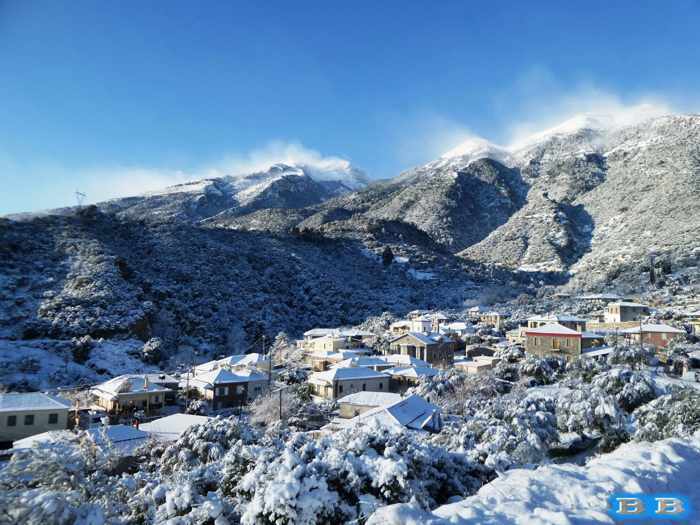 If you’re on Facebook you can view more photos in this album from the hikers’ New Year’s Day climb to the mountain peak after three days of snowfalls on Chios. 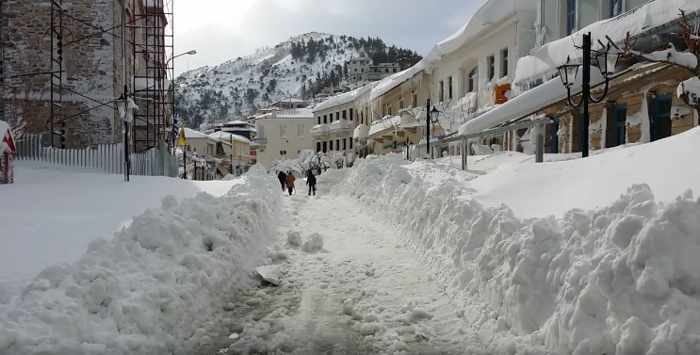 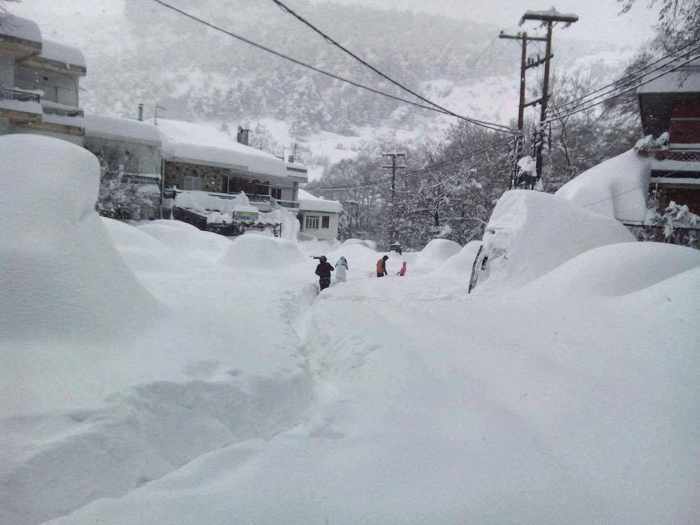 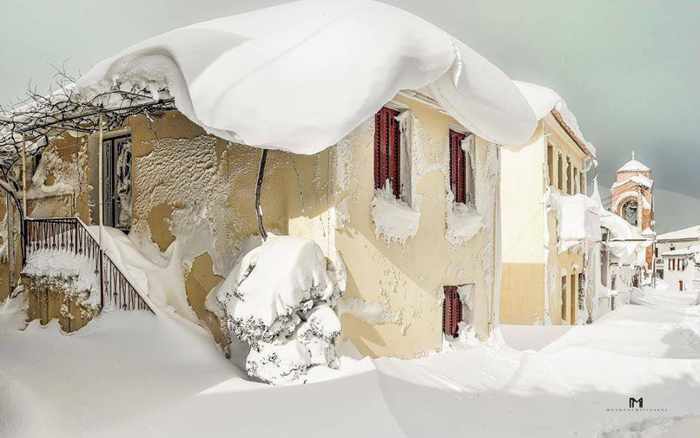 On Facebook, Anatoli Tsa shared several startling videos of the waist-deep snow that clogged the streets in Kymi. 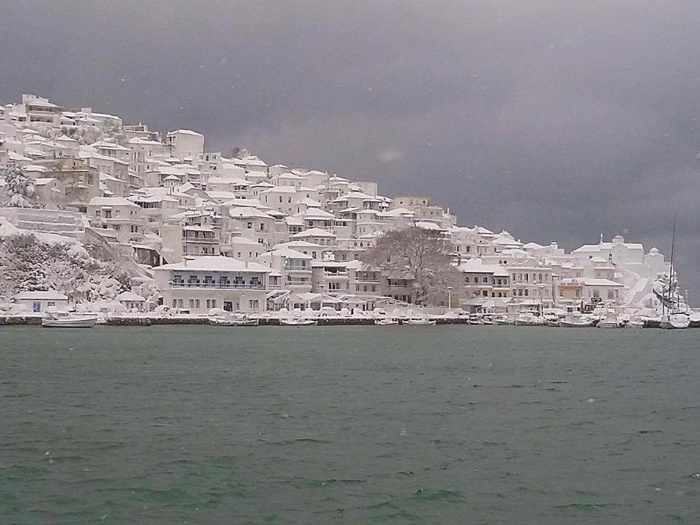 This is a screen capture from one of the videos. 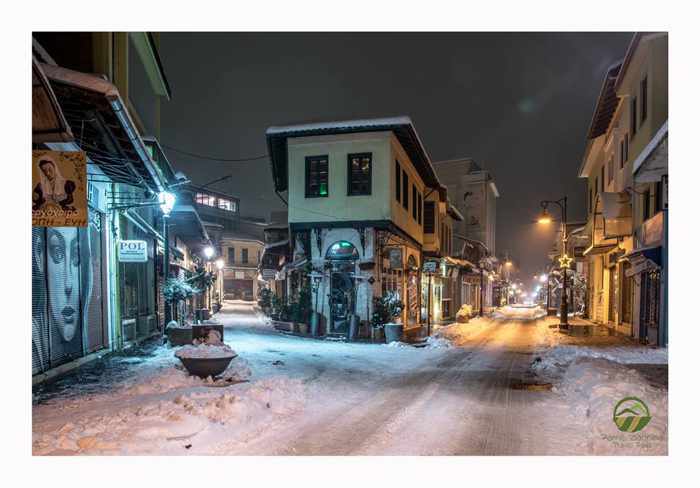 If you’re on Facebook, you can view Anatoli’s album of videos here. 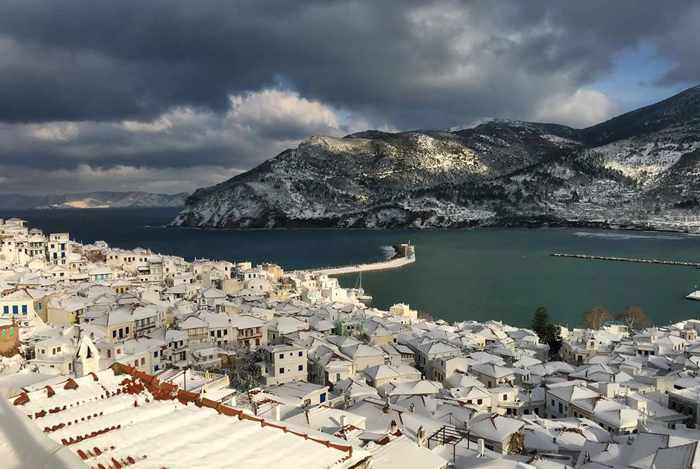 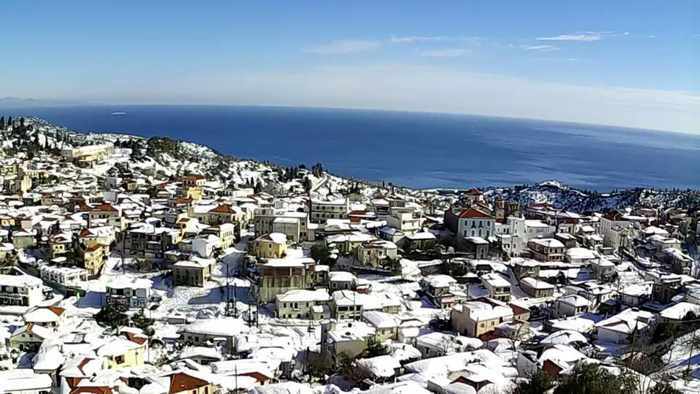 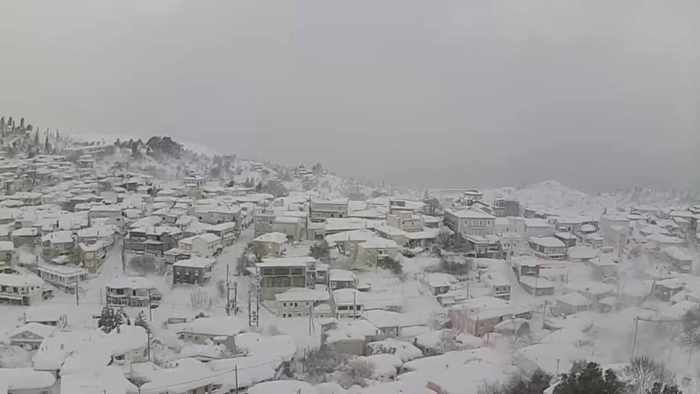 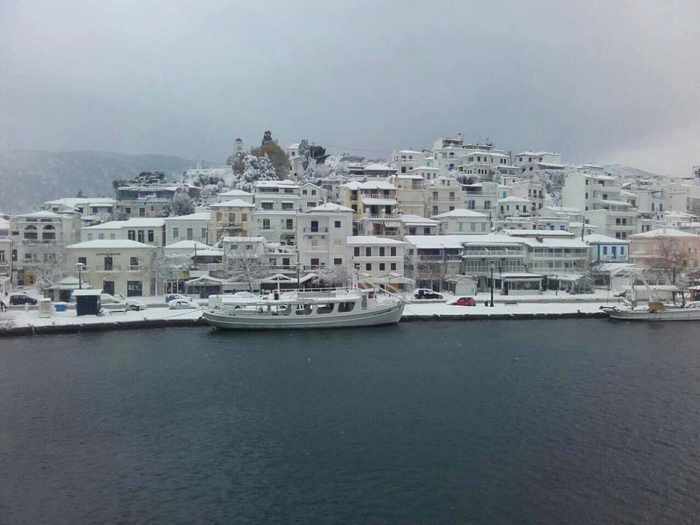 This photo of Skopelos Town, seen following a snowfall, has been shared extensively on social media. 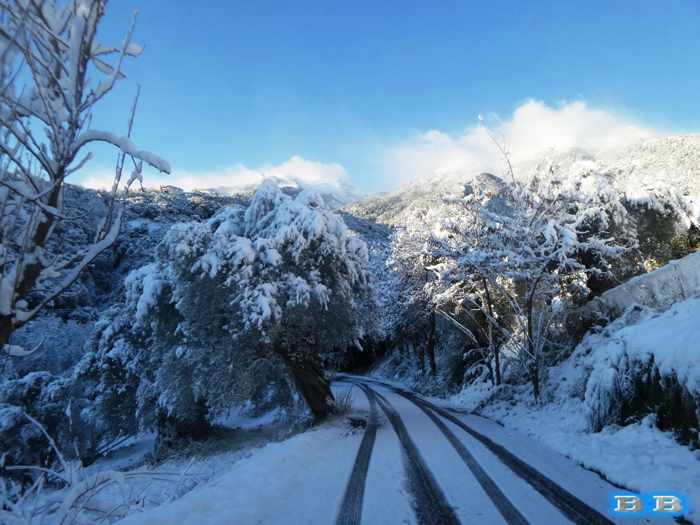 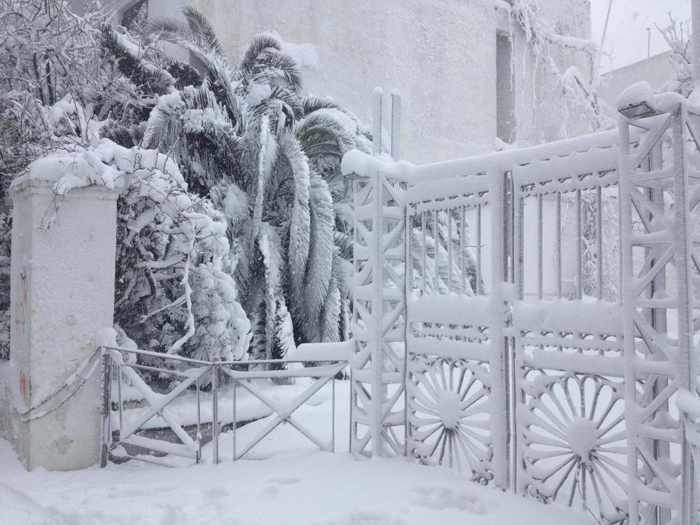 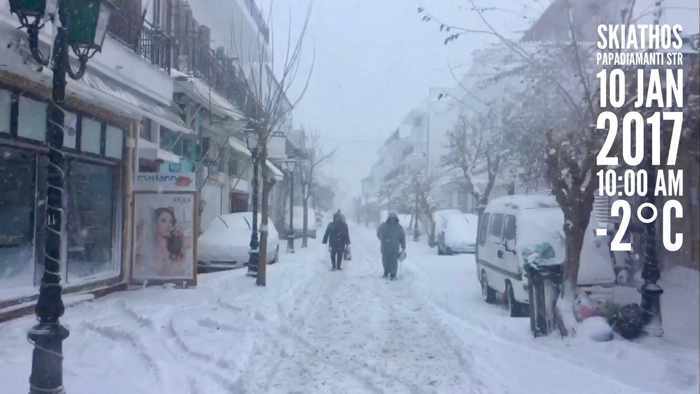 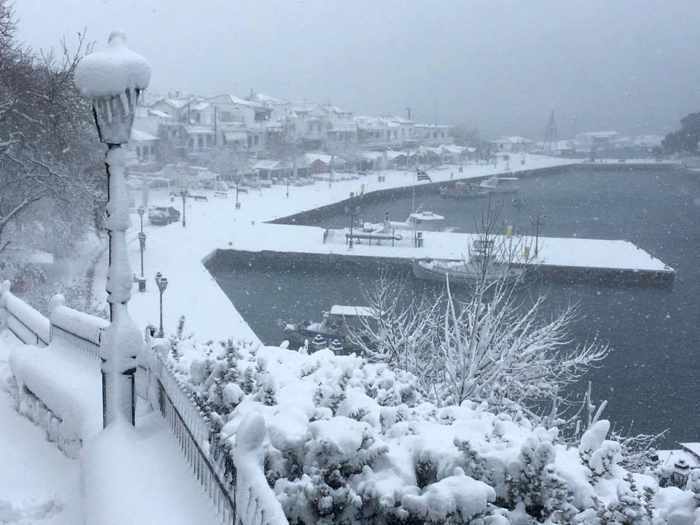 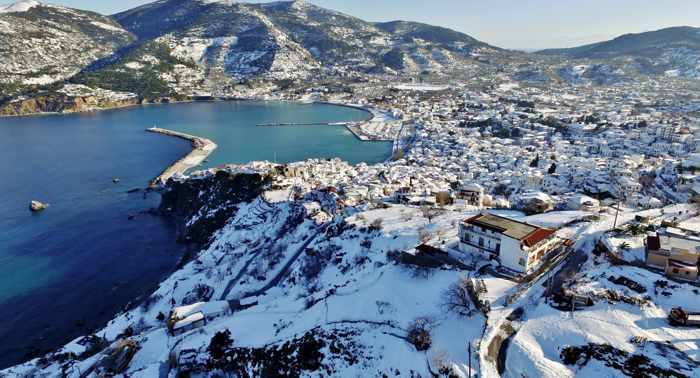 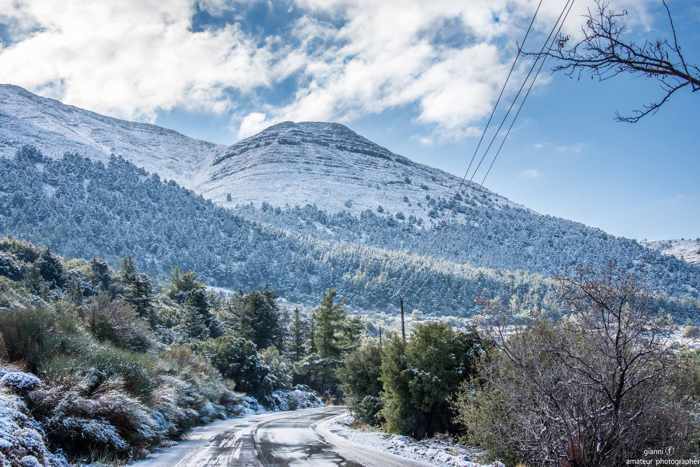 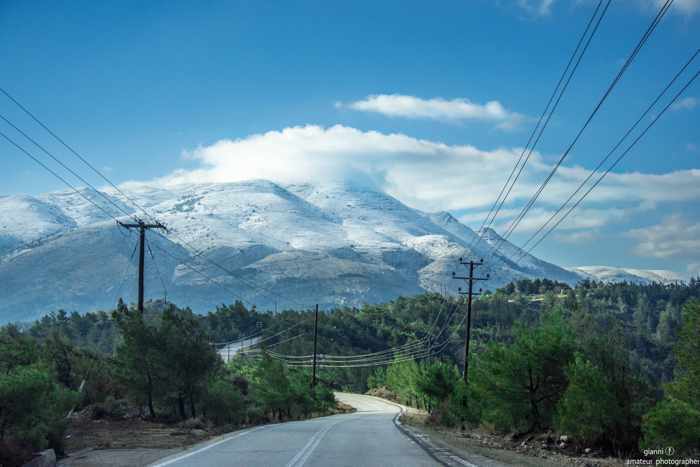 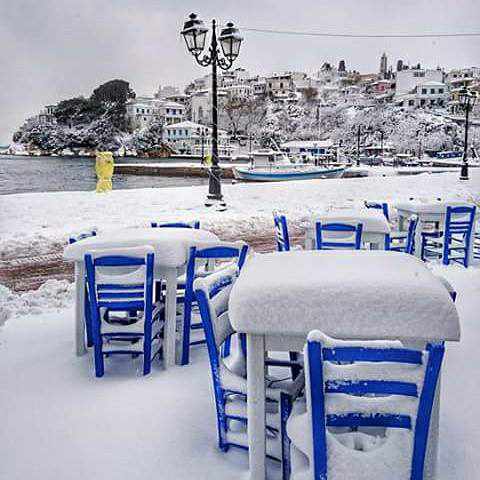 The image was one of several snow photos of Skopelos that the Keep Talking Greece website posted in its January 9 article “Life in snowed in village” — Report & pictures from Skopelos. 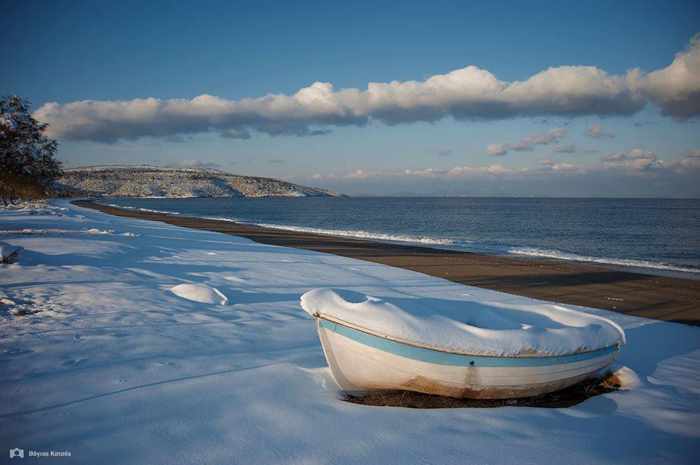 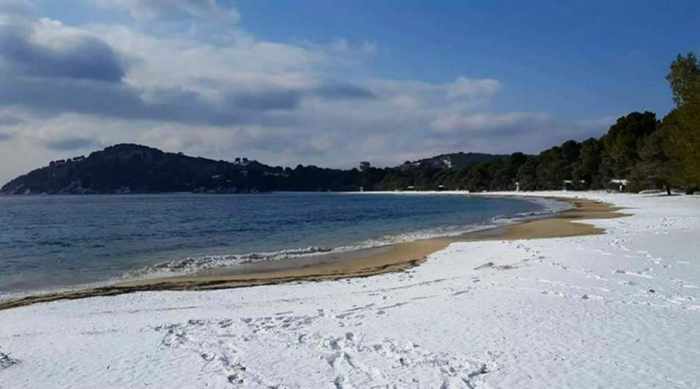 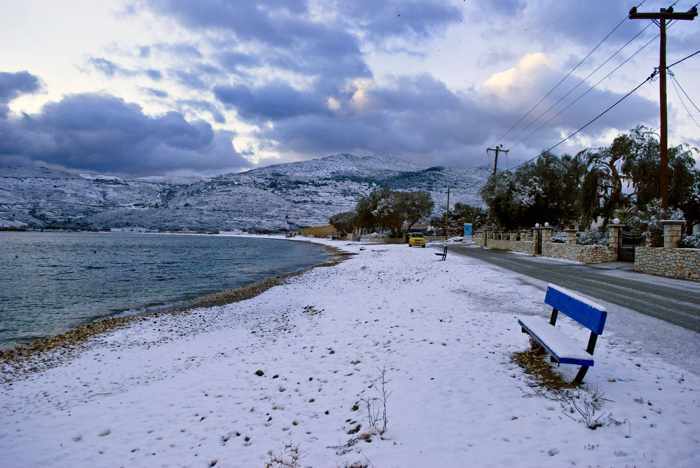 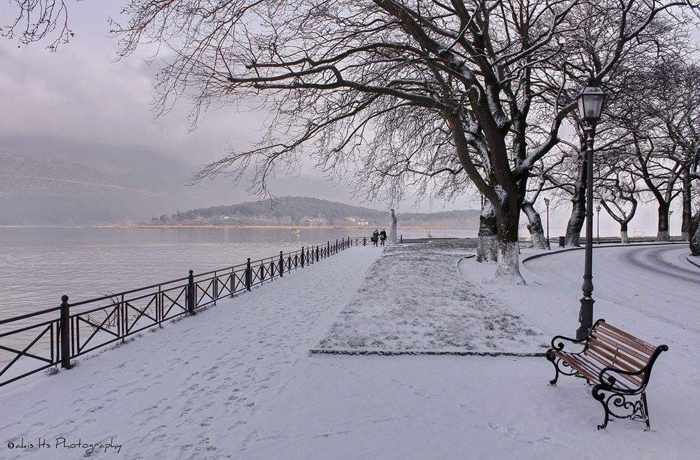 Another widely shared photo of snowy Skopelos. 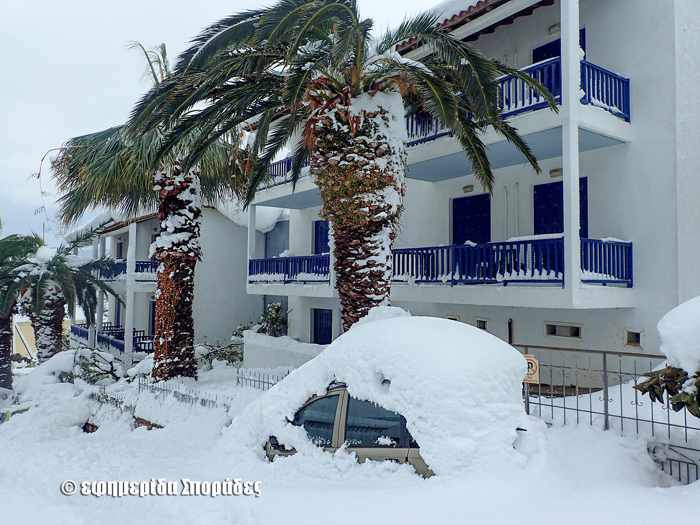 I found this image on the Greek Islands Facebook page, which credited the photo to Babis Stivachtis. 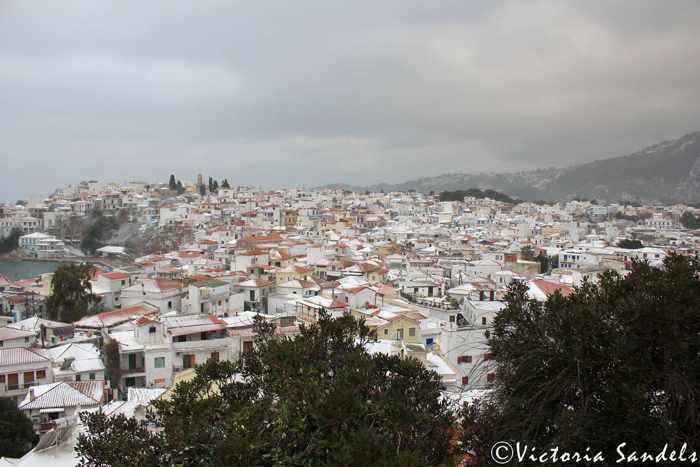 … as well as this photo, showing more of the town from a slightly different perspective. 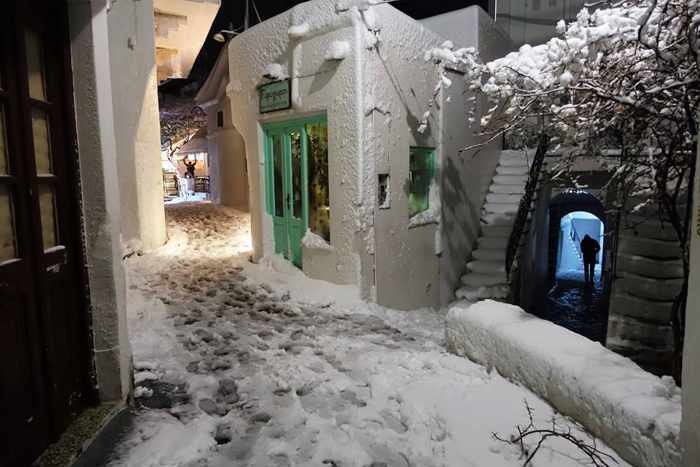 The Εφημερίδα Βόρειες Σποράδες news agency also posted this photo of a man walking down a Skopelos Town street inundated with snow. 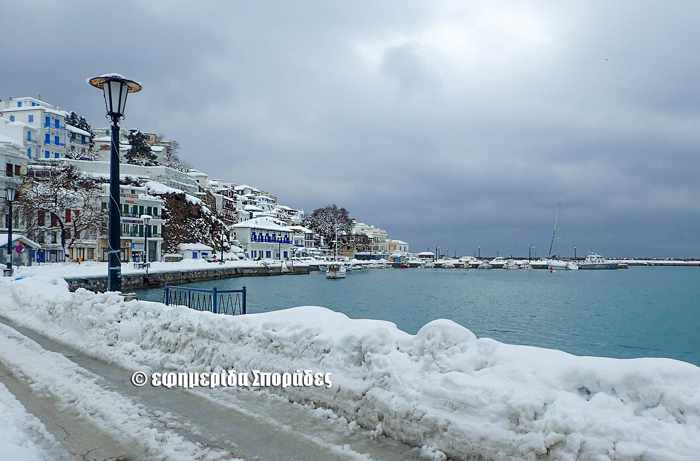 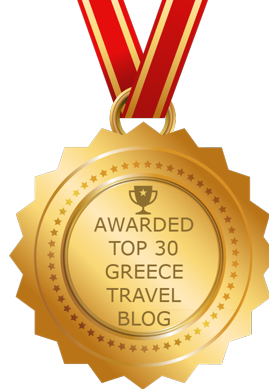 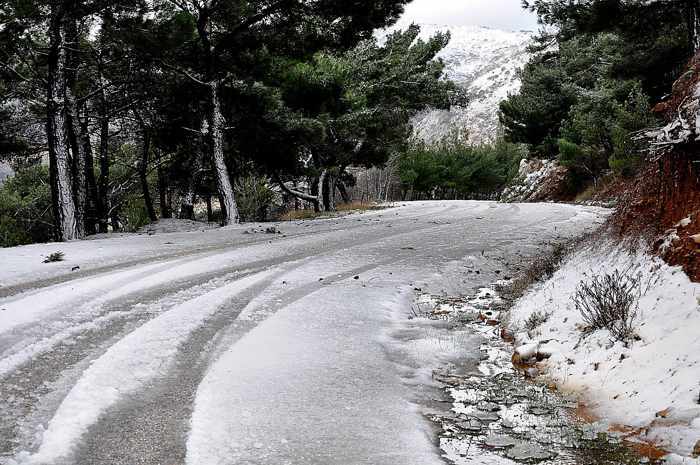 According to media reports, the January snowfalls were the heaviest to hit Skopelos in more than 30 years. 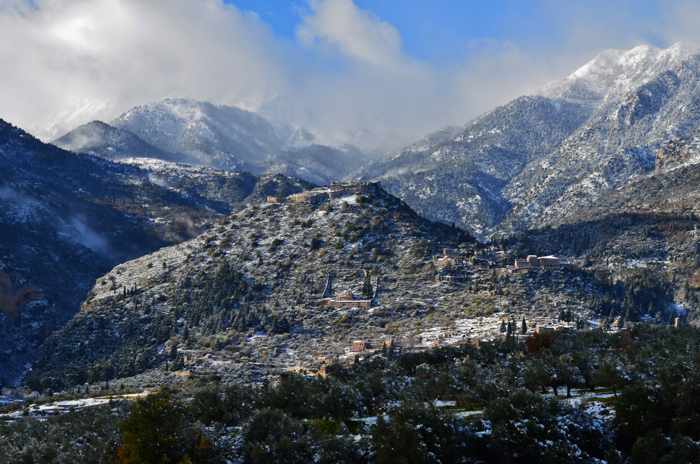 Light snow dusts the mountainside where the historic Mystras heritage site is located (foreground), while some of the Taygetos mountains provide a dramatic backdrop. 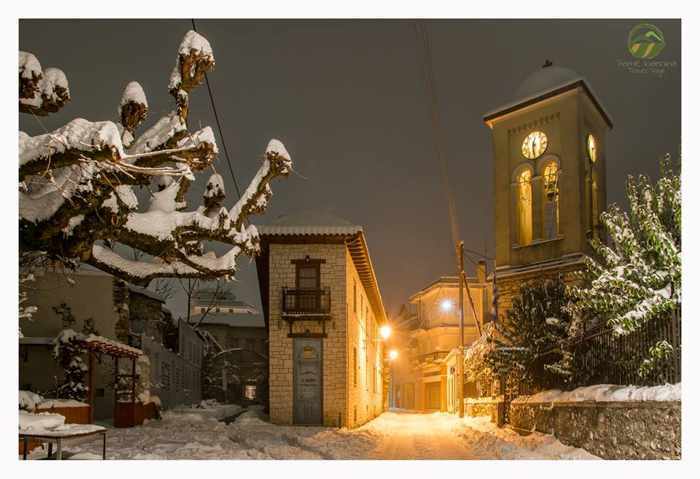 The photo is from a Mystras collection on the Evrotas blog of landscape photography. 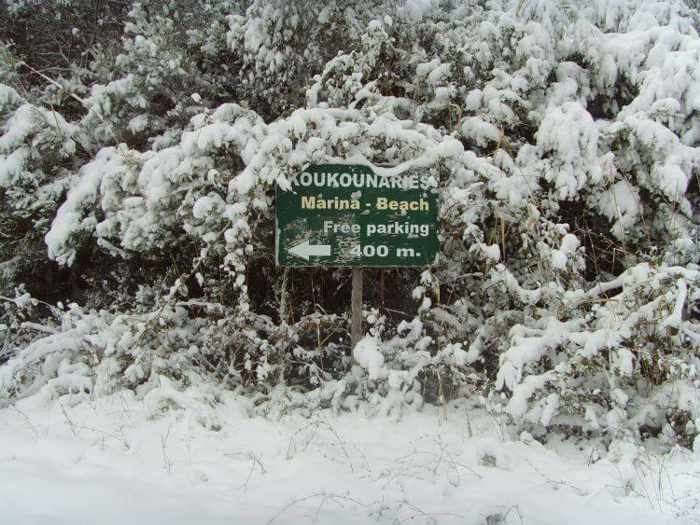 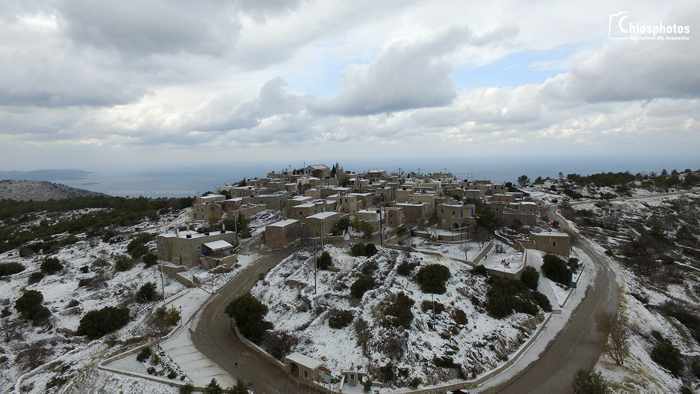 Another Evrotas blog photo of snow at Mystras. 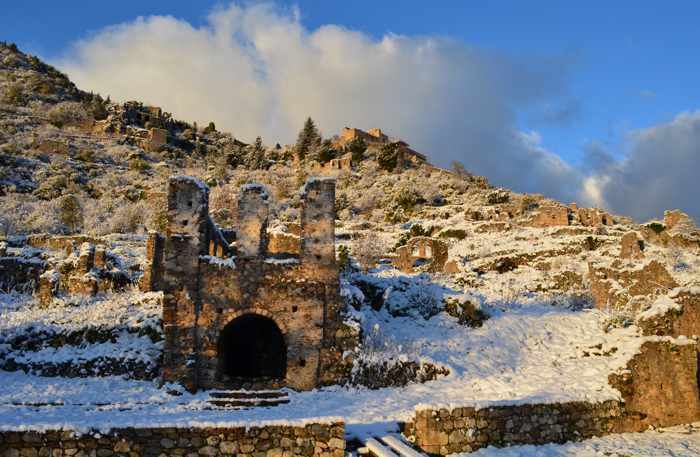 You can view dozens more beautiful winter scenes from this world heritage site in a special Mystras photo collection on the Evrotas blog. 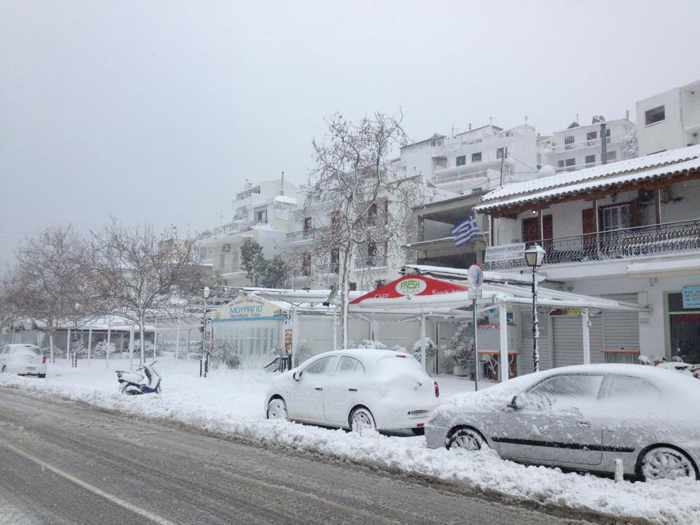 Another Notospress photo of snow in Sparta. 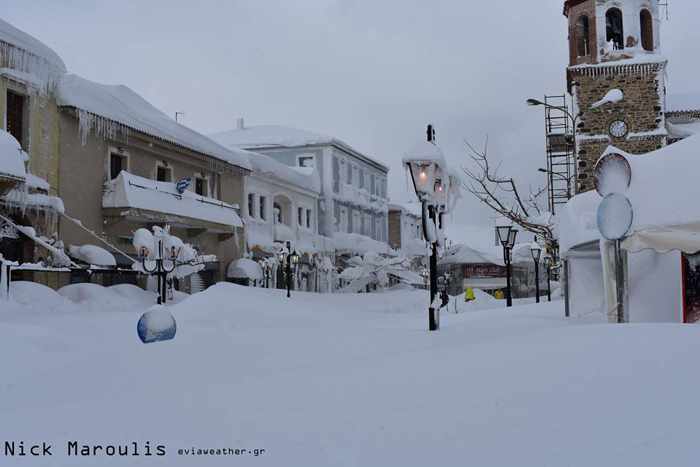 If you’re on Facebook, you can see an album of Sparta snow photos that Notospress pubished on January 10. 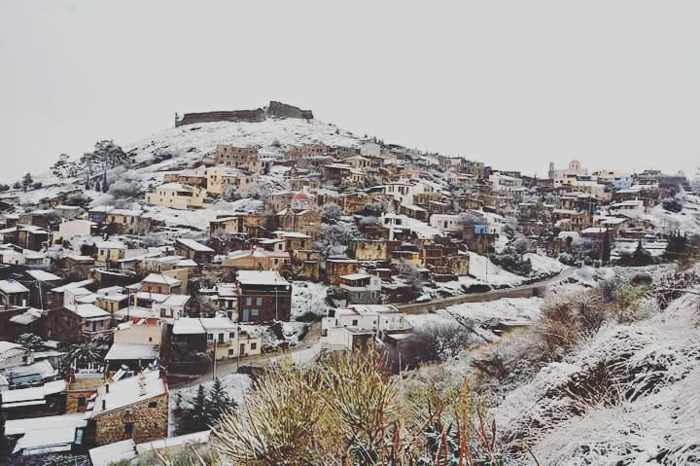 A view of Vordonia, a mountain village near Sparta. 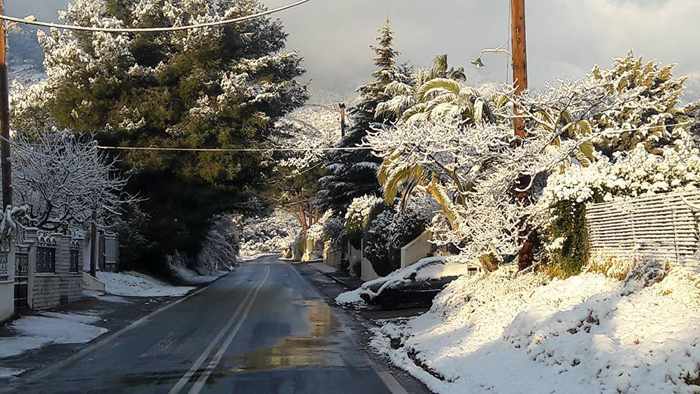 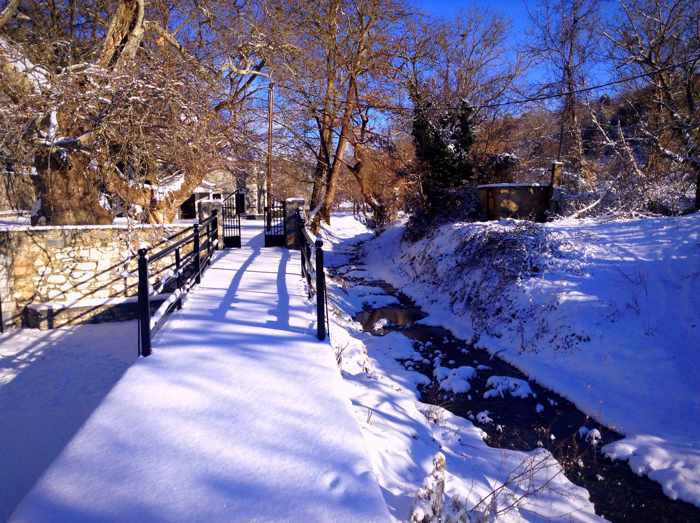 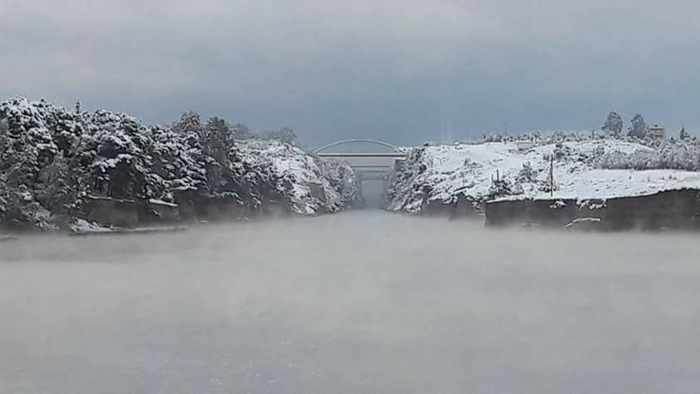 The photo, taken by the locally-published website Bordonia Blogspot, was posted on the Bordonia Blogspot Facebook page on January 10. 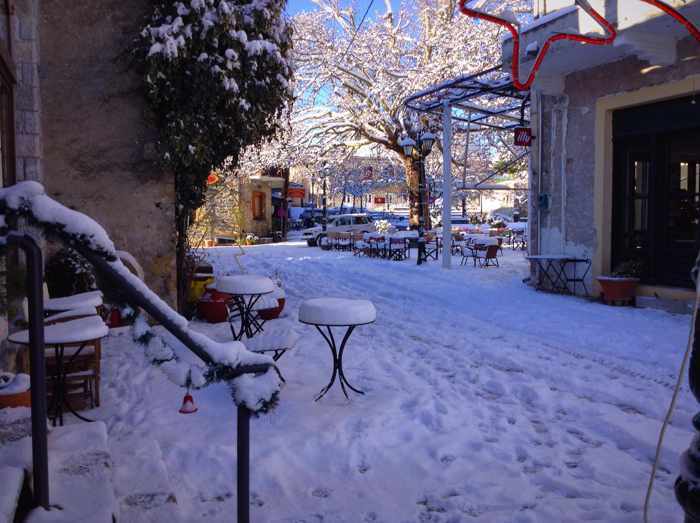 Another winter scene from Vordonia. 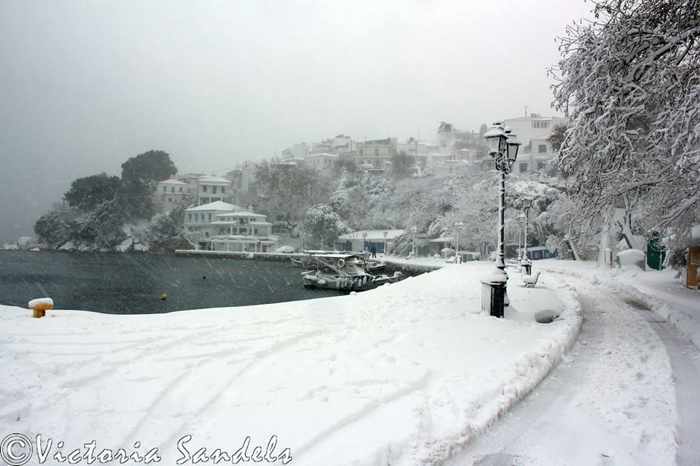 This was one of several photos posted to the Bordonia Blogspot Facebook page. 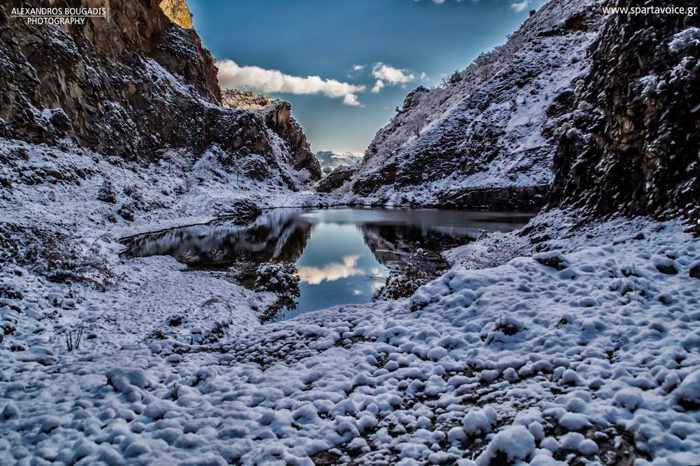 Photographer Alexandros Bougadis captured this image of a lake in the Taygetos mountains near Sparta. 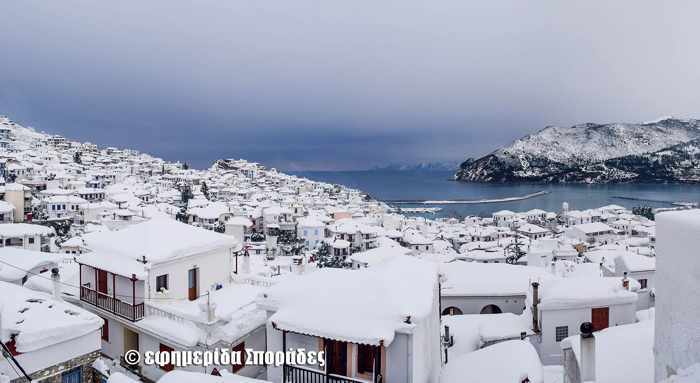 The photo was originally published by the Sparta Voice website. 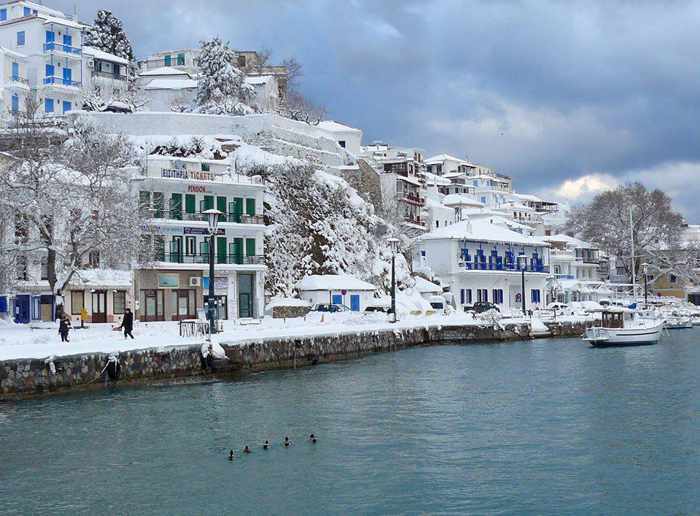 Click here to view dozens more photos of winter scenes in Greece, in Part 2 of this post.